If you have a question for the CYCO staff then this is the place to ask. 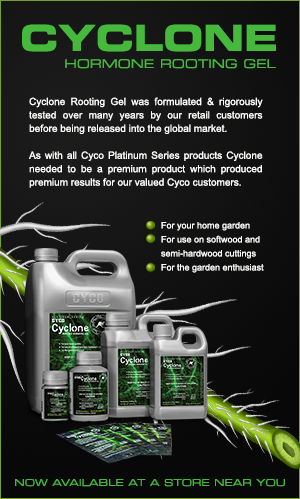 The CYCO forums are for serious discussions on the use of the CYCO Platinum Series of products. We ask you to be mature and to refrain from posting anything that may offend either the users of the forum or CYCO management themselves. This is the official CYCO forums and as such should be treated accordingly, any text, images etc that we deem inappropriate for the CYCO forums will be deleted immediately with possible user bans to follow. I'm using your Grow A & B + Bloom A & B along with Kleanse at the moment and was wondering if someone could answer a few questions I have about the feeding charts provided on the Cyco website. I'm using the "Basic feed chart for Hydroponic use" chart with Cyco Coco Lite in 5 gal fabric pots, I'm using RO water and just top feeding them with a watering can. 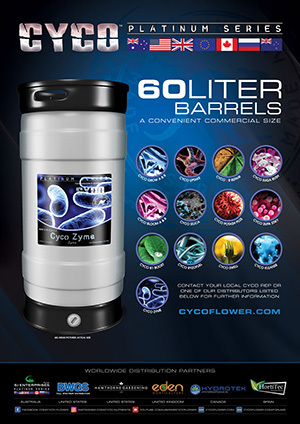 I'm currently half way through flower and on your chart I've put in that I'm using 2 litre (I use 3 x 2 litre bottles to mix the nutrients, and apply as needed, some times 4 l, some times 6 L) and that I'm only using Cyco Bloom A & B. The chart it telling me to use 6ml per bottle (3ml/L) which I did throughout the veg cycle and the plants grew pretty much perfectly for someone with my limited experience. But I can't help but notice that its also telling me that my PPM should be 1500 or E.C 2.1 from week one onwards in the flower cycle. When I put 3ml per litre (6ml of A and B into a 2 litre bottle) my Blue Lab Truncheon is telling me the PPM is something like 300-400 PPM or 0.6-0.8 E.C. Am I doing something wrong here or am I alright to just feed them 3 ml/L throughout flowering? I'm asking because I saw this and upped the ratio to 12ml/L each of A & B, which brought the PPM up to about 900 (E.C 1.8) I fed this about 3 times over 3 days, which I'm starting to think was a mistake. I've only recently got a bottle of Kleanse and started flushing on Sunday for the last 3 weeks using 2 ml/L ( 3 x 2 litre bottles) and have noticed the plant seems to have come to a standstill and looks under developed for 5 weeks of flower, and I'm getting the old growers anxiety that I'm screwing something up. Am I doing this right? Is it ok to simply add Kleanse into RO water and water with that on a Sunday? Again, I'm using Cyco Coco Lite. Perhaps check the batteries in your meter, if they are flat they will normally read low, the reason i say that is i ran hydro stores for 10 years and it was a common error. 12mL will burn your plants so please get the meter checked, at that strength you will do serious root damage so an urgent flush is required and back to the recommended dosage. Now that thats cleared up, what do you reckon about the Kleanse? Is it alright to use the 4ml (in the new cup lol) in 2 litres of RO water with Cyco Coco Lite? I was assuming that because the feed chart off your website says that that particular chart is for Cyco mediums including Coco Lite, that it would be fine, as you guys, of course, know your product best after all. But I keep reading on forums and such people saying "never feed Coco water without any nutrients in it, it screws up the "feed cashions" or something like that? I'm not sure if Kleanse is considered a nutrient or not?